NAO with image camera simulated in SimSpark. ts for all sides: developer and user community of SimSpark would grow, the Simulator becomes more realistic and transfer of the solutions between the leagues becomes easier. 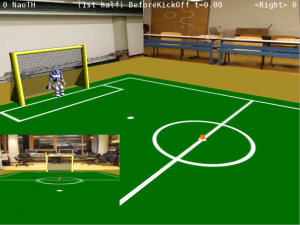 In this project we will extend the SimSpark simulator for usage in the SPL league. Since, the technical suitability alone is not enough to establish SimSpark within SPL, promotion and support of SPL teams to start with SimSpark are a part of the project. 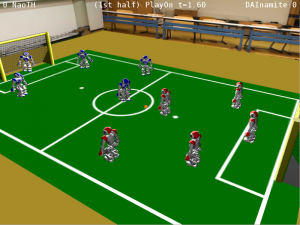 A full SPL game is simulated with virtual vision.